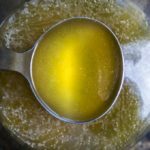 This Instant Pot Chicken Bone Broth is super quick and easy to make in the Instant Pot, and just so nourishing and delicious. Plus, it's great in soups and stews! Combine all the ingredients in the Instant Pot. Add water to cover the bones, plus 2-3" if room in the Instant Pot. Cook on high pressure for 120 minutes. Let pressure release naturally for 10 minutes, then use the manual release. A total of 2 lbs. of chicken bones/carcass is recommended for the best flavor. Any chicken bones will work for this chicken bone broth recipe. I typically save the carcass from a chicken I've roasted, and I also save the bones from any recipe where I use bone-in chicken (i.e. legs, thighs, wings, etc.). You could also make this with pork, turkey (I love this Instant Pot Turkey Bone Broth), beef (make sure not to use marrow bones), lamb, veal, and any other meat you can think of. I recommend looking for large bones, and also smaller bones with a little meat on them. The meat helps to add flavor to the broth. I use a 6 quart Instant Pot for this recipe. For an 8 quart Instant Pot, you may want to add another 1/2 lbs. of bones, or add less water. You can also add whatever vegetables you'd like to enhance the flavor of the broth. I stick with a simple onion, a few carrots and a couple stalks of celery. Note that I do not add salt to this bone broth recipe. When I use this chicken bone broth in other recipes, I like to adjust the salt as necessary for specific recipes. If you are drinking it straight, you will want to salt it to taste, otherwise it will taste bland. I don't recommend adding salt during the cooking process as the salt concentration becomes very high. To get an even richer flavor, you can add an extra hour to the cook time. To freeze: Let the broth cool slightly and pour into ice cube trays. Place in the freezer. Once frozen, place ice cubes in large freezer bags. This enables you to use smaller amounts of the bone broth. You can also freeze in 1 cup containers, or just freeze the whole batch in a freezer safe container if desired.